Susan Hutchinson has run the West Oxford Academy for a few seasons now. I’ve spoken there myself about The Register, the Inquirer and TechEye and churnalism. The talks happen at the West Oxford Community Centre, a five minute walk from Mill Street. It costs two quid and for that you get a 20 minute talk from locals – and a glass of wine. 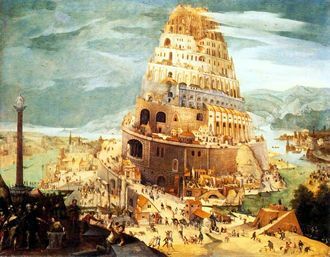 Last night we were treated to a most interesting talk by Ian Thompson, called The Tower of Babel: the world’s language families. The place was packed. Ian started off with a comparison of numbers from different languages – it’s the ek do teen char, eka dva tri chatur common to the Indo-Iranian language groups, but there was an anomaly on his slide, with the Basque language not conforming to the pattern. In fact, said Ian, language is largely based on onomatopeia – and there are four major language groups although there are exceptions. In Gaelic terms, the last Cornish speaker died in 1974 – there still is a tape of Ned Mandrell speaking the language. He said: “Gaelic speaking people school kids were punished for using their own language until the late 1940s.” My mum was born in Aberdeen 1915 and had some Gaelic, but my dad was based in Skye during the Second World War, and told me when I was a kid that no-one there understood English and the people spoke the Gaelic. How times have changed. Interestingly, Ian spoke about the influence of the west on language analysis by academics, where Sanskrit, Greek and Latin were considered pukka languages, while the truth is somewhat different, considering languages like Chinese, and African families of language were, in the past, undervalued by western academics. Of course many languages are dying or are already dead. Still, when the west “discovered” India, they were also a bit shocked to learn that one Panini had “discovered” the basics of language before the Christian calendar arrived.